Bangalore: In May, when Wipro Ltd won a $500 million (Rs2,400 crore) strategic outsourcing contract from mobile-phone services firm Unitech Wireless Ltd, very few people knew about the key role played by the technology firm’s consulting arm in helping it clinch the deal. “We were able to bag the deal because of the initial work done by the consulting division which made Unitech understand the value we could bring to the table," says Anurag Srivastava, vice-president, Wipro Consulting Services. “One of the key advantages of being in the consulting space is the huge downstream revenues it generates for other businesses such as application services and infrastructure management." Unitech Wireless is a joint venture between Unitech Ltd, India’s second largest property developer by market value, and Norway’s Telenor ASA. The firm is yet to roll out its network. While the Unitech deal was a key win, it was an exception rather than the rule in India’s software services industry. Five years after most top Indian information technology (IT) companies, including Tata Consultancy Services Ltd (TCS), Infosys Technologies Ltd and Wipro set up their consulting divisions, they are yet to make a substantial impact either in terms of revenue generation or in acting as a multiplier in generating downstream revenue. IT research and advisory firm Gartner Inc. estimates that while the market size for all IT services worldwide is around $872 billion, the consulting opportunity makes up about 9% of it. Traditionally, IT consulting has been dominated by the likes of IBM, Accenture Plc, Capgemini SA and Deloitte Consulting Llp. Top Indian IT players get less than 5% of their total revenue from consulting. Infosys, India’s second largest IT services exporter, was one of the earliest to set up a separate consulting division, back in April 2004, when it incorporated Infosys Consulting Inc. as a subsidiary in Fremont, California. It invested $20 million and hired rainmakers from other consultancies such as Deloitte Consulting, PricewaterhouseCoopers and Electronics Data Systems, or EDS. “Consulting was a natural progression for us. It was already embedded in areas like package implementation or our banking, financial services and insurance (BFSI) offerings," says Kris Gopalakrishnan, chief executive and managing director of Infosys. “But we wanted to evolve from technology consulting to business strategy consulting. We were also clear that we did not want to be in the management consulting space where the likes of McKinsey (McKinsey and Co. Inc.), BCG (Boston Consulting Group) and Booz (Booz Allen Hamilton Inc.) operate." J. Rajgopal, executive vice-president and global head, consulting, TCS, says a presence in consulting helps in raising brand equity, generating higher margins, enhancing CXO relationships and helping get additional business for traditional IT services offerings. “Consulting was a critical component of our strategy to be a full, end-to-end services provider," says Rajgopal. TCS set up its consulting division at the end of 2005. Indian firms have found it hard to crack the global consulting market. For instance, TCS last year derived a mere 3.47% of its total revenue of Rs22,404 crore from the consulting business. “We generated about $162 million (Rs777.3 crore) in revenue from the consulting business and have about 280 clients. Revenues are about the size of what a mid-sized consultancy traditionally has," says Rajgopal. For 2008-09, Infosys Consulting had 96 clients, generated revenue of Rs287 crore and a net loss of Rs59 crore. 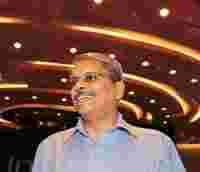 The normally unflappable Gopalakrishnan bristles at any suggestion that the consulting gambit has failed to pay off. “Every research and advisory firm puts us in the leader’s quadrant in the consulting space. I don’t know where this impression (of it not having paid off) is coming from. It also depends on what consulting is defined as," he says. “Is it services for which we bill more than, say, $100 per hour? By that metric, nearly a quarter of our revenue comes from consulting. But if it is from an advisory consulting point of view, we get about 4-5% of our revenues. Where we have failed is in scaling up, and we are addressing this issue. One also has to take into account the consulting expertise which is a part of the verticals and industry offerings that Infosys has, and not just look at the numbers of the subsidiary." Gaurav Gupta, principal and country head of Everest Group, a global consulting and research firm, says Indian IT firms are still marginal in the global consulting space. “Consulting is a high-risk, high-reward game which is cyclical also. There is little room for labour arbitrage in consulting. Indian IT players prefer predictable, safe revenues even if margins are lesser." Srivastava of Wipro admits that Indian IT firms have some way to go before they can catch up in consulting with their larger and established multi-national rivals. Still, Indian firms have one key advantage in their consulting plus global delivery model (GDM), he says. “Unlike some of the MNC consulting companies who just deliver a report at the end of a consulting assignment, we are ready to walk the talk. We have the capabilities to implement the recommendations." That, in fact, can act as a handicap while pitching for consulting assignments. Chandramouli C.S., director, advisory services, Zinnov Management Consulting Pvt. Ltd, says Indian IT players are seen as using consulting assignments to generate revenue for other offerings in their portfolio, limiting their objectivity. Indian companies are also seen as very process-driven, whereas consulting is still a people business. Indian companies ought to move to partnerships from just relationships with clients. “There are cultural aspects too. It is easy to bag a consulting assignment if you are playing golf over the weekend with a CEO who is convinced that you understand the business," says Chandramouli. “Indian companies look to offshore consulting work, which does not work. They need to have more feet on the street. Also, consulting assignments need to be led by industry and not technology experts." Rajgopal of TCS says one-third of his consulting team of 750 people are not people of Indian origin and 150 of them are based in the North American market. Sudip Saha, senior research analyst at Springboard Research, says that since consulting is growing at a faster pace than traditional IT services, Indian IT firms need to step up their game. “In tough times, clients are more prone to look at innovative solutions which can save costs and deliver better efficiencies. Indian companies’ value proposition continues to be cost even in consulting," he says. “If the established players charge $250 per hour, Indian players do anywhere between $125 and $175 per hour. Nothing wrong with that. However, they need to enhance their industry and domain expertise both organically and through niche acquisitions." The current downturn in the market provides an opportunity to Indian players to expand their consulting footprint. “While the focus is on operations and sustenance, we believe that Infosys Consulting is better placed to take advantage of the current environment," says Gopalakrishnan. Gupta of Everest and Saha of Springboard both say that all the Indian IT firms have made some progress. While Wipro has managed to carve out a niche in the utilities, energy and outsourced research and development space, Infosys has made a mark in retail and BFSI, and TCS is seen to be strong in the business process outsourcing, finance and insurance platforms. “Slowly, they are building their strengths. In the next 10 years, they should ideally get 40% of their revenues from the consulting business. It’s difficult, but not impossible," says Gupta.